The CSP-625 protects laptops with the convenience of a combination lock! Never worry about losing the key! 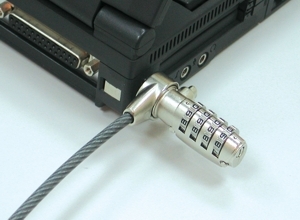 Combination laptop lock kit uses the built in security slot! Provides laptop security for most all laptops that have the built in security slot. No more keys to worry about! Provides protection against opportunity theft. 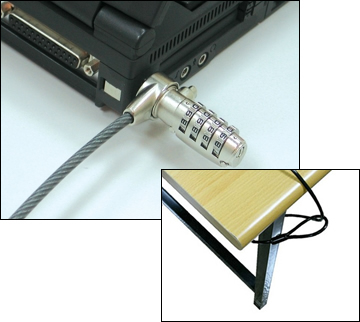 By attaching to a frequently used desk or other immovable object, the fastener below can be used when you do not have a table leg or data hole available to wrap the laptop cable around. This composite rectangular glue-on attachment is a permanent installation. Can be used on plastic, wood or metal. Enough adhesive will be supplied to secure the number of attachments ordered.